With the Paring Knife, cut garlic, thyme, tarragon, and capers, according to the instructions. Using the Filet Knife, take the skin off the fish fillets. Pat fish dry and season with salt to taste. 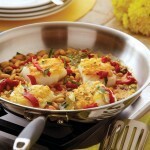 Preheat the 12-inch Gourmet Skillet for 4 minutes at medium temperature. Spray skillet lightly with non-stick spray. Place the fillets firmly non-skin side down; make sure the fish is evenly spaced out so the steam from cooking it can evaporate (fish should sear, not steam.) 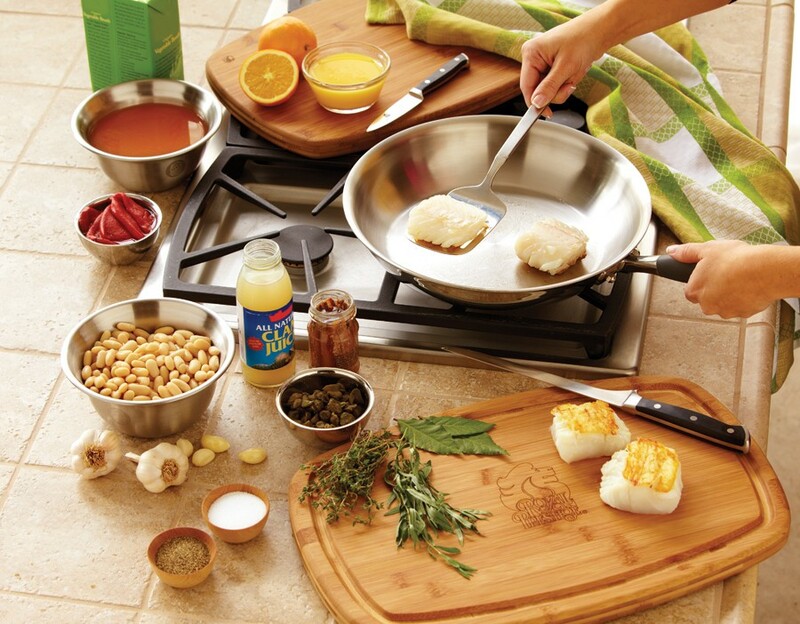 Cook the fish for 4 minutes or until the edges get golden brown. Only sear one side. 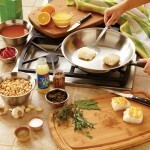 Using the Slotted Turner, remove the fish fillets and set aside on a plate with the browned side facing up. In the same skillet, add garlic, thyme, anchovy paste and capers. 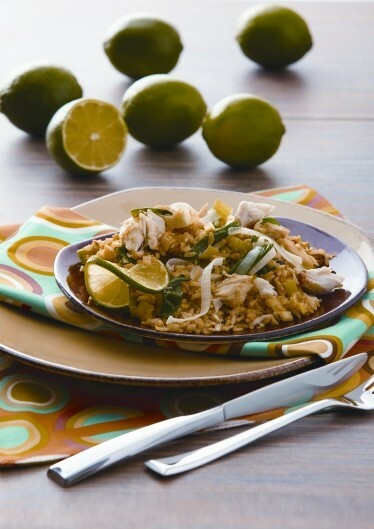 Reduce temperature to medium-low and sauté for 4 minutes or until lightly brown; stir frequently. Add orange juice, clam stock and bay leaves; raise temperature to medium-high and reduce mixture by half for 5 minutes. Add vegetable stock and white beans; cook for 5 minutes. Place the fillets, evenly spaced out, back in the skillet; sprinkle with tarragon and add roasted red peppers. 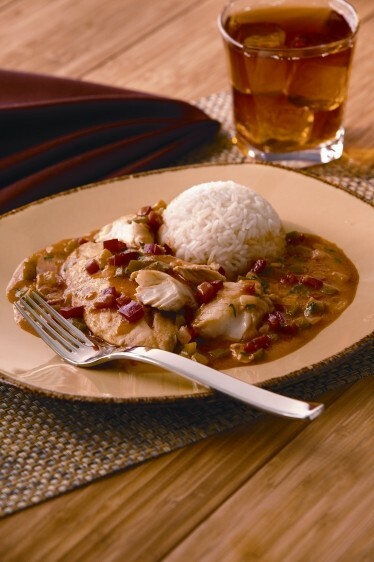 Cover and reduce temperature to medium-low; cook for 5 minutes or until fish is cooked. Serve. 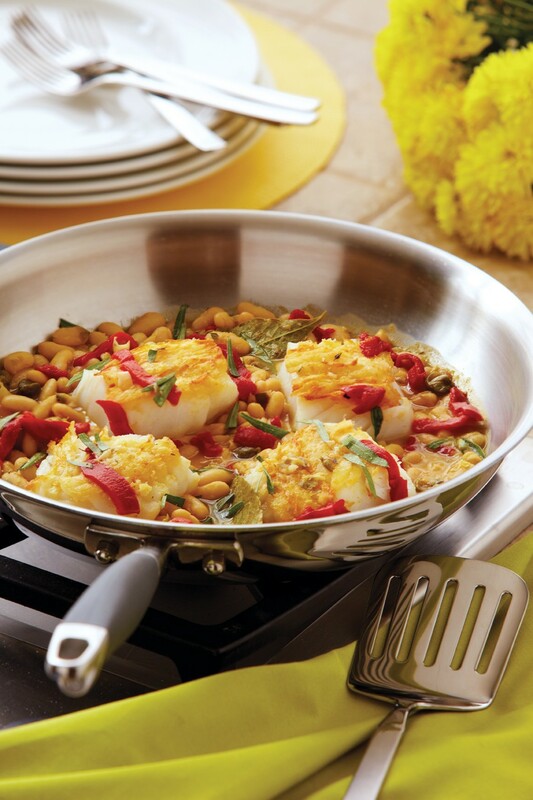 Chef’s Note: Our Pan Seared Cod makes for a delicious Easter Dinner alternative!